Cutie Pie wants to keep going with learning his letters, so as we go this time I’m trying to concentrate a little more on the lowercase letters. I happened to be blog hopping a week or so ago and came across a link to Chalk in My Pocket’s post the Easiest Letter Activity Ever. It is exactly what Cutie Pie needed to connect upper case to lower case letters and it truly is easy! 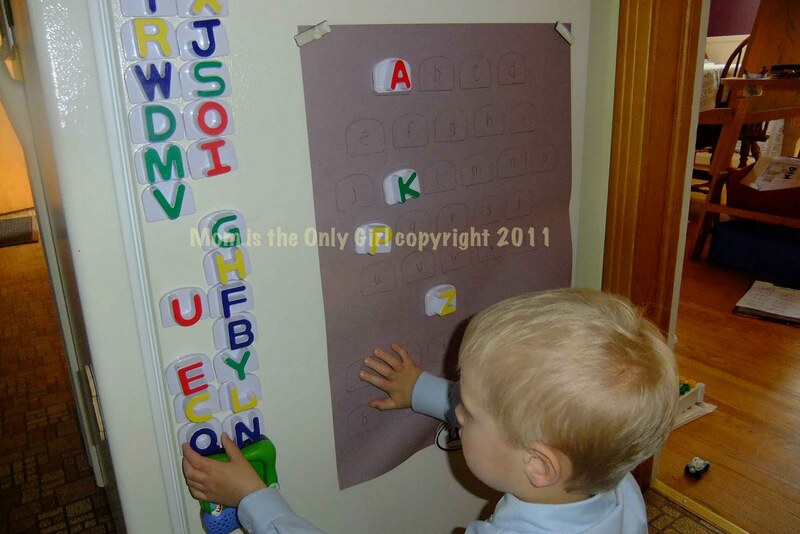 Simply outline the LeapFrog refrigerator magnets on a large sheet of paper and write in the lowercase alphabet! It hadn’t occurred to me before, but the LeapFrog refrigerator magnets are all capitals, so Cutie Pie doesn’t have the opportunity to play with lowercase letters. Now he can! This isn’t something I make him work on, it’s just something that hangs on our refrigerator and I find him there every once in a while! Great idea! Our preschool can pass this on to our parents as a way to help the kids start on letter recognition. Hi! This is Kelly from I've Become My Mother. I hope this is the first time I commented regarding this. We have a dear friend whose daughter needs a bone marrow transplant – Could you please share her story on your blog, Facebook, and Twitter. Your prayers are very much needed… Thank you so much! thank you for linking up to bassgiraffe's Thoughts. just letting you know that your blog was drawn to be Star Blog for Thursday. My post will go up tonight at 8EST. Congrats. following you via thursday bloghop! Following you from Blog Hop Thursday. Love your blog and I have two boys as well…and one girl to help break up the testosterone a bit. Follow back when you get the chance.